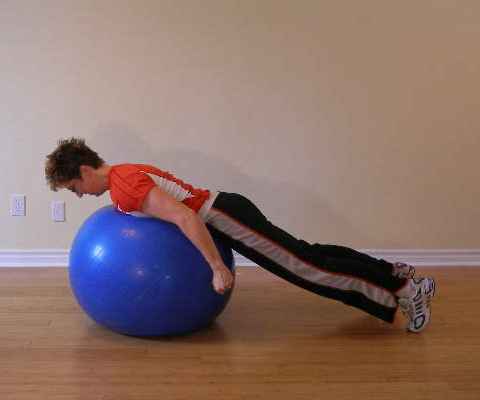 Start this ball exercise in the straight arm plank position just as you have done in the pushup exercise. Feet are about shoulder width apart you have 3 points of contact with the floor. keep it easier to begin with by making the area of contact the ball makes with the floor as large as possible by keeping your exercise ball very soft for this exercise. Without moving the ball, quickly pull your arms back to your sides. Allow your body to drop onto the ball. As you rebound upward, catch yourself in push up position, with extended elbows. Start this exercise with elbows bent until you get a feel for how the ball is going to respond to your weight. When doing the high impact exercise ball exercises it's best to use a burst resistant ball. For safety's sake start this with a spotter. Try 1 sets of 3 repetitions. Try 3 sets of 3 repetitions. Try 3 sets of 10 repetitions.